In the USA, today is Flag Day. Recently, my hubby and I traveled to visit our girls who live on the east coast. Our older daughter lives in Baltimore, and many times when we visit, we travel to an interesting area near Baltimore. We have been to Annapolis, where the Naval Academy is located, Williamsburg, Yorktown, and Jamestown. We've made trips to Gettysburg and Philadelphia, where we took in the history of those two places. As we planned our trip this year, I told my daughter that I wanted to go to Ft. McHenry. She was surprised that we had never been there since it is located on the Baltimore Harbor. I said we had seen it, when we sailed on the harbor, but we had never actually been to the fort. So we made plans to visit the historic site. Here is a photo of my hubby and me, standing at the entrance to the fort. Ft. McHenry is famous for a battle in the War of 1812. The battle inspired Francis Scott Key to write "The Star-Spangled Banner," which became the US National Anthem. At the visitor center we watched a film about the battle and writing of the song. We listened to a ranger talk about the flag that flew over Ft. McHenry. I learned something that I didn't know before. That flag had fifteen stripes instead of the thirteen we know today. 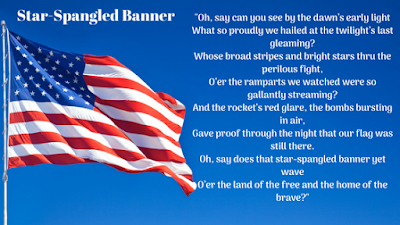 There were fifteen stars and fifteen stripes on the flag. They had added stripes when they added stars. Eventually, they came to realize that the flag would look rather bizarre if they continued to add stripes each time they added a star, so they settled on thirteen stripes for the original thirteen colonies. You can learn more about the fort by clicking here. Here is a photo of the fifteen-stripe flag. "O'er the ramparts we watched." Do you have a historic site that you have visited or would like to visit? What has prompted your interest in this site? 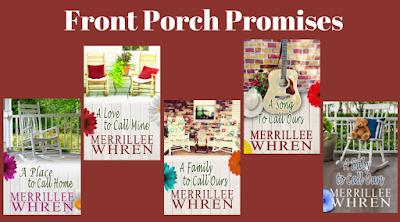 Book Five in my Front Porch Promises series, A BABY TO CALL OURS, is ready for preorder. Reserve you copy now. I always visit historical sites wherever we vacation, but we never got to Ft. McHenry when we visited family that used to live on the Eastern Shore of Maryland. Jean, if you ever go back to that area, you should visit the fort. The film at the visitor center is very moving. Merrillee, thank you for sharing about Ft. McHenry. How interesting about the 15-stripe flag! Magdalena, you're welcome. The ranger talk was full of all kinds of interesting information. History is one of my favorite subjects so I enjoyed your post. I recently read about the history of some towns in California that I've been to my whole life and never realized the things that had taken place there. Temecula is one of them. The battles between the "Indians" and the settlers were so harrowing. Cindy, yes, it's fun to discover things you didn't know about before. I really enjoyed this. I don’t remember hearing about the 15 stripes before. I’ve only been to the east coast once, but it was amazing to visit the civil war sites. Standing in a beautiful restored home that was built before my home state (WA) was even a state gave me a new perspective. So true, Pam. History does give us a new perspective about our lives. I love visiting historical sites and learning the history. I have to say the favorite place is always the current one that I am learning about. It is too hard to choose . I love anything to do with history, Merrillee. And today, Flag Day is also my wedding anniversary. It's funny that sometimes you don't know something, then you see it over and over. I just read about the 15 stripes this morning then saw it again here. I'm sure I'll see it again today! Antietam was one of the saddest historic sites I've been to, so many lives lost! But the Alamo is my favorite, even though so many lives were lost there too! I've never been to Antietam, but I've been to the Alamo. Since you have lived in this area, you know that we have a multitude of historic sites within reach for a day trip or even an afternoon outing. While I always enjoy St. Augustine, I find that I also like going to places like Fort Frederica on St. Simon's Island, Georgia or driving up to Amelia Island to visit Fort Clinch, even just going to Kingsley Plantation here in Jacksonville. Thanks for the history lesson - I did not know about the 15 stripes, either! Mary, I always enjoyed going to Fort Clinch. I even put it in one of my books, Four Little Blessings. I enjoyed your pictures and the history you shared. We like to visit Fort Osage, which isn't that far from us. It was a trading post, and we like to wander around it and read the little bits of history on the signs. Our kids thought their posts looked like sharpened pencils. Fort Osage was also one of three forts established by the U.S. Army to establish control over the newly acquired Louisiana Purchase territories. One of things our children enjoyed was the "whipping post" which has large rings to bind people to when they whipped them for their wrongs. I love to learn the history of an area. My family indulges me when we are traveling. I knew about the 15 stripes. Makes the flag out of proportion, doesn't it? Yes, I'm glad they came up with the thirteen stripe solution. I have also been to Baltimore but have not visited Ft McHenry. I live just north of Philadelphia and will have visit there. Right now I am in New Bern NC on vacation where there is a lot of civil war history. I like to take tours on a bus or trolley where they show you the historic stuff.